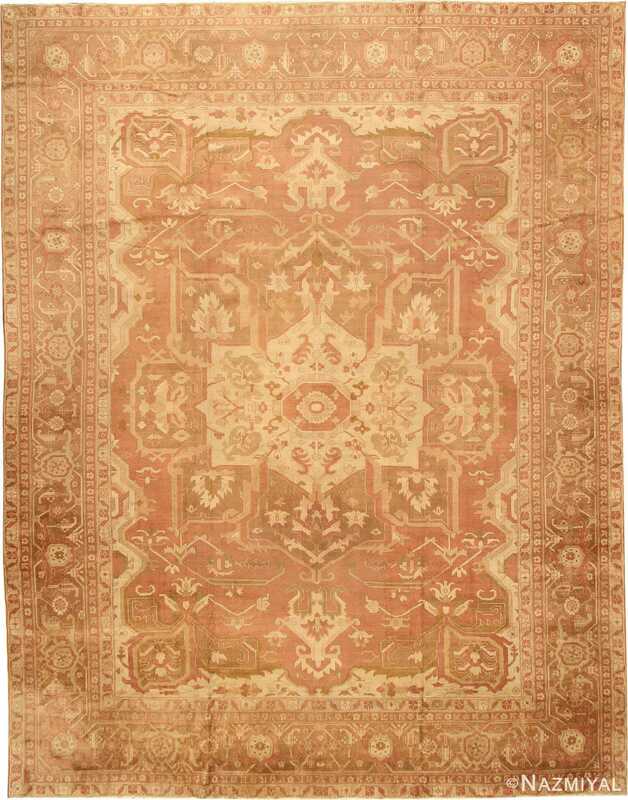 Antique Amritsar Rugs – The spectacular rugs of Amritsar capture the exotic style of India while incorporating a subtle colonial influence. This convergence of eastern and western styles results in an exceptionally alluring appearance that has been beloved by western consumers historically and today. The outstanding old Amritsar carpets were created by influential exporters to fuel the demand for exotic rugs and textiles following Queen Victoria’s 1851 Great Exhibition in the Crystal Palace. Elegant curvilinear botanical motifs and superior materials have made Amritsar carpets particularly desirable and easy to appreciate. 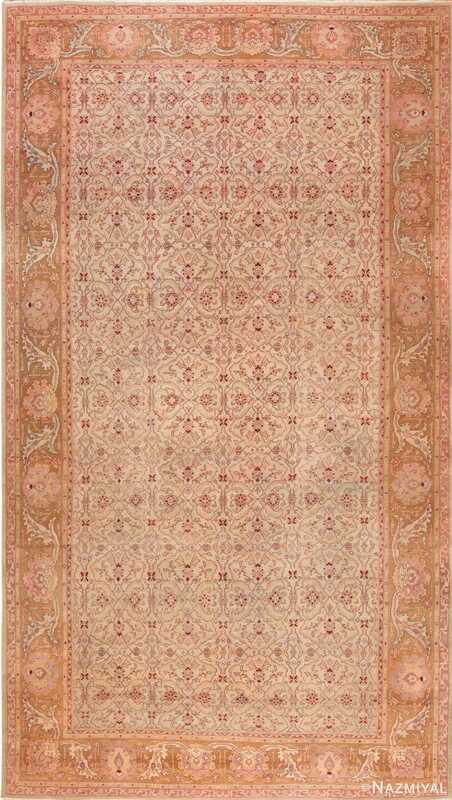 Amritsar carpets are extremely distinctive within the production of Indian carpets. 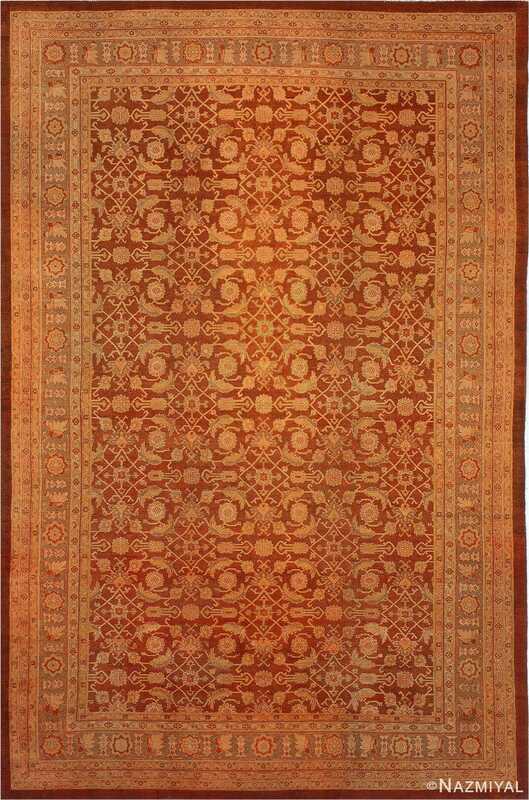 Unlike the Agra Rugs, those produced in Amritsar, in the far north of India near Kashmir, do not represent a continuous production back to Mughal times. They seem to have resulted from a new nineteenth-century initiative under British rule. 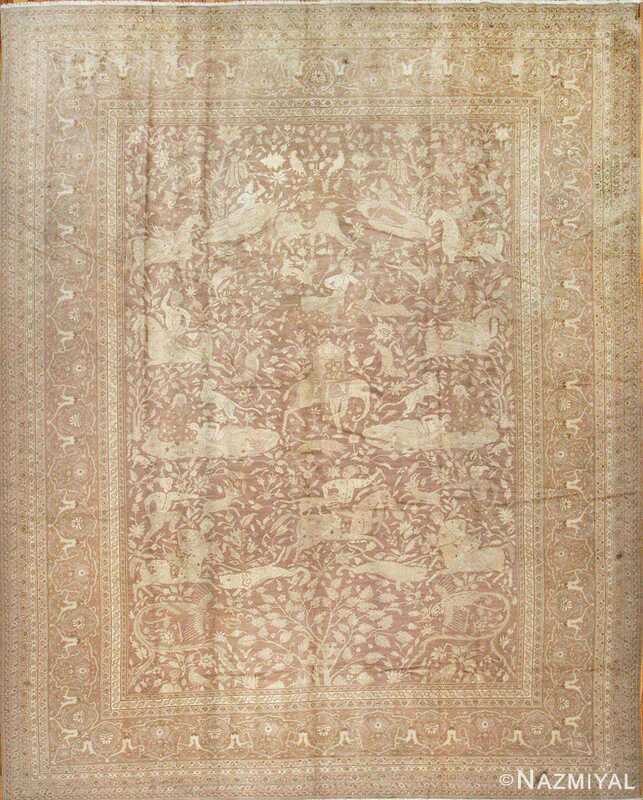 As such the Amritsar rug weavers were free to approach carpet design more on the basis of western needs than on their own traditions, so their carpets were from the outset well adapted to western decorative use. While their designs responded to contemporary Persian production, Amritsar rugs were generally made with a softer earthier palette, often with a tendency to burgundy or aubergine tones. 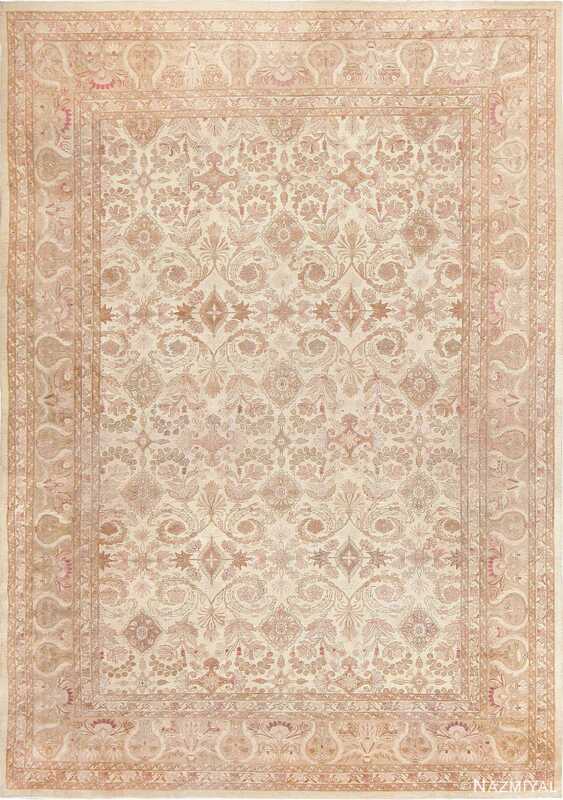 To this day, they remain a superior decorative rugs by virtue of their flexible formal repertoire and coloration. Amritsar is located in northwest India. 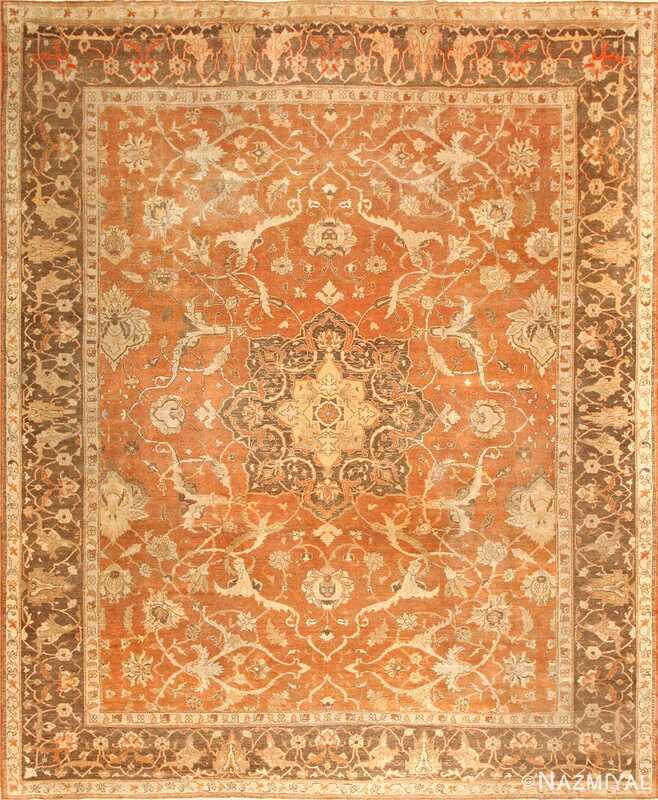 Carpet production began in the late 19th and early 20th centuries during the rise of the British supremacy. Due to Western influence and European demand, the weavers were very prolific during this period. 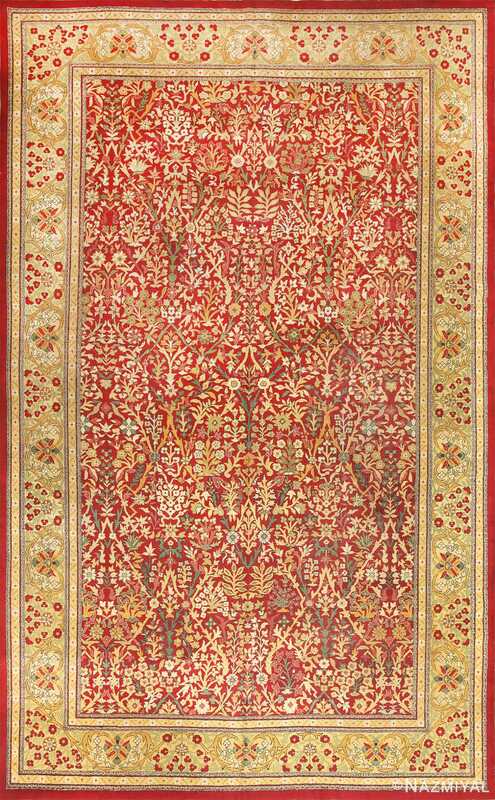 Designs appealed to Western tastes employing large-scale patterns featuring millefleur (thousands of flowers) motifs. 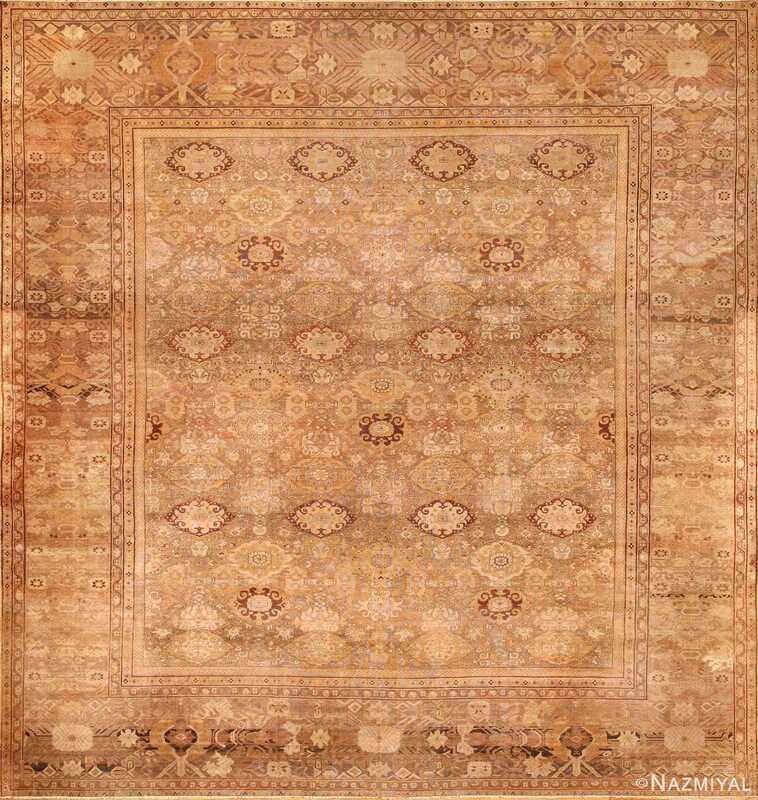 A subtle color palate of light blues, yellow, teal and rust characterize these Indian rugs. 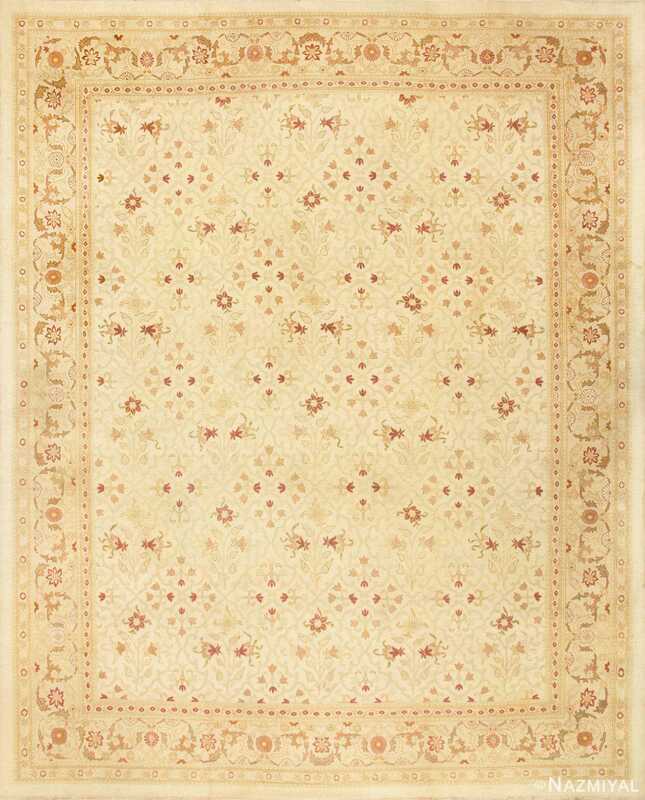 Amritsar rugs often have cotton foundations, are double weft and use an asymmetrical knot. Very good quality wool is used resulting in a luxurious feel. The popularity and influence of Amritsar rugs can be traced back to the British Empire’s Colonial rule in India. For the first time, in 1851, at the Great Exhibition in the Crystal Palace, Queen Victoria exposed the world, including laypeople, to the exotic look and feel of the Orient, and began the Western world’s love affair with purchasing “exotic” home furnishings. The craftspeople of Northern India were quick to capitalize on this trend, making sure they could meet the demand for Amritsar rugs from wealthy people, especially in London, who considered it a status symbol to have beautiful, handcrafted Oriental rugs throughout their opulent homes. Amritsar rugs were also a point of national pride for the English. For example, every time a Londoner displayed an Amritsar rug in his home, it was a reminder of the tremendous power and scope of the British Empire. National pride, in conjunction with all of the wealth that began pouring into the United Kingdom because from the sale of Oriental goods, were the main drivers in creating a large, highly-profitable market for Oriental artwork, in general. 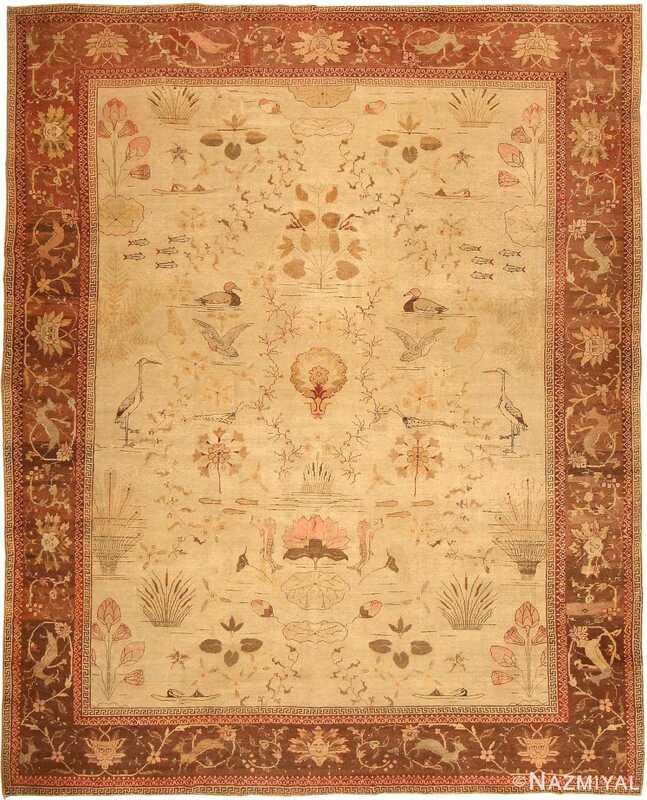 Collectors in London, the United States, Canada, and other Western markets, were especially enamored by the elegant designs on Amritsar rugs, such as curved botanical motifs, and greatly appreciated the superior materials used in manufacturing these works of art. The soft, earthly palette of most Amritsar rugs, which featured burgundy or aubergine tones, complemented their other furnishings, making the rugs even more desirable. Today, the Western world’s fascination with Oriental pieces of art – including Amritsar rugs – continues. The rugs remain highly desirable for collectors, mainly because of their flexibility to blend in with the color and style of elegant, modern homes throughout the world. Almost 200 years later, the unique styles of rugs that emerged in the nineteenth century in India are still widely regarded by art critics and historians, as some of the best designs ever created within the art and home furnishings industries. 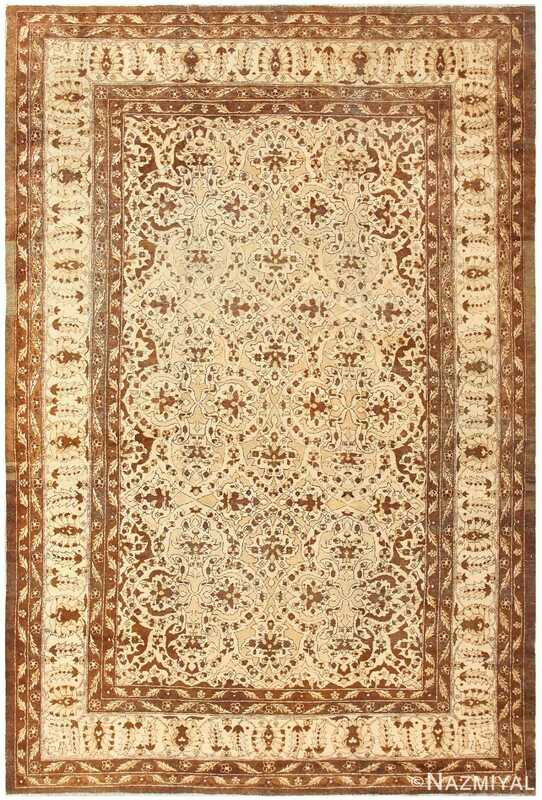 During the period of Colonial rule over India, Amritsar rugs began to reflect Western influences in their design. The craftspeople of Northern India took their chance to profit from the ever-increasing demand for exotic carpets by Queen Victoria. It was after the Great Exhibition in 1851 in the Queen’s Crystal Palace that the wonders of the Oriental lands were brought to the world’s attention. London took easily to the wildly different and exotic, yet oddly familiar patterns that Amritsar rugs offered. Oriental rugs made the United Kingdom even wealthier than before, and the popularity of exotic artwork was on an uptick. 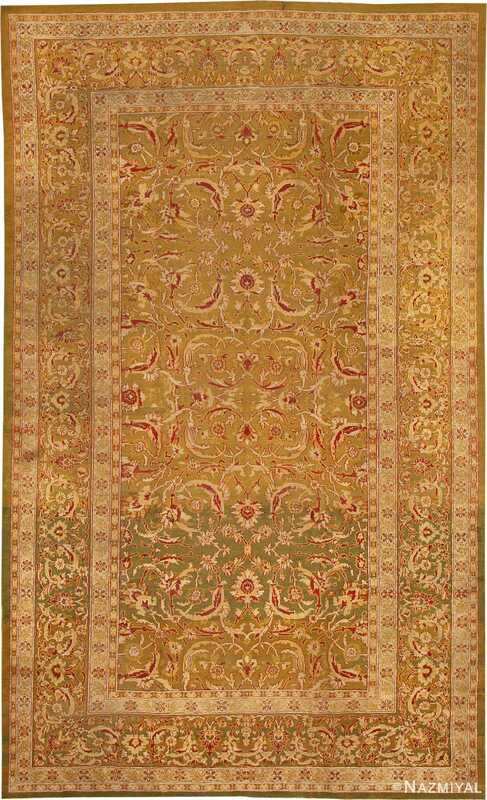 Amritsar rugs reflected British influence in India while still retaining elements of surprise and mystery. 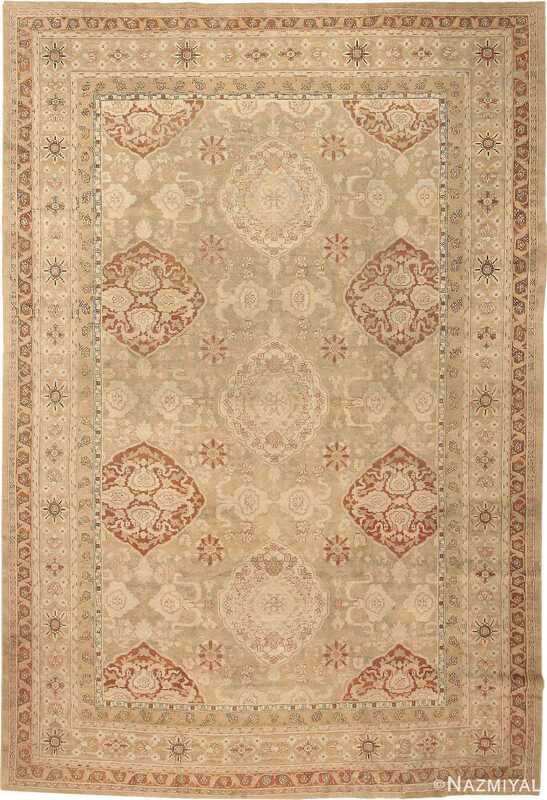 Amritsar rugs center on plant-like motifs that swirl and curve into elegant designs. 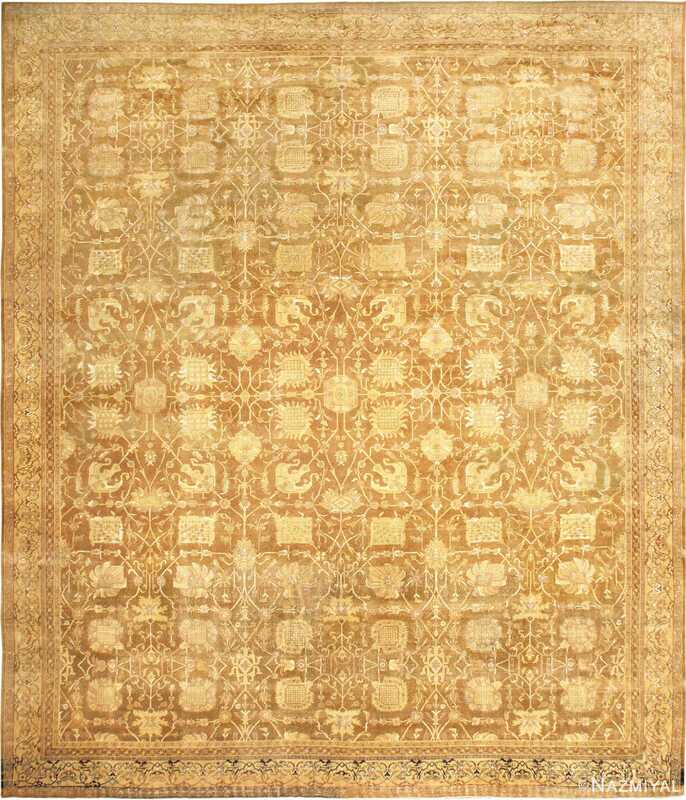 Rugs are made from materials of only the highest quality. Designed with the British, Americans, and Canadians in mind, Amritsar rugs feature a toned-down earthy palette with burgundy hints that don’t overwhelm the eyes. 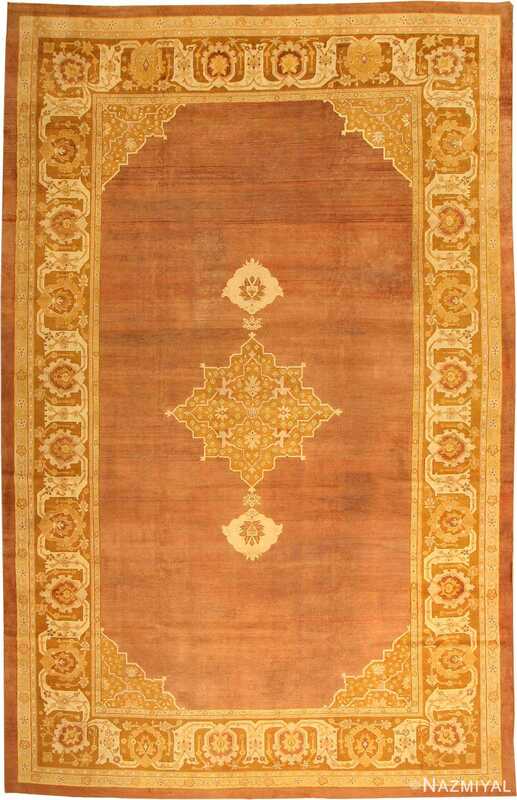 These rugs are far more modest and much less boastful than oriental rugs woven in bright reds and rich purples. 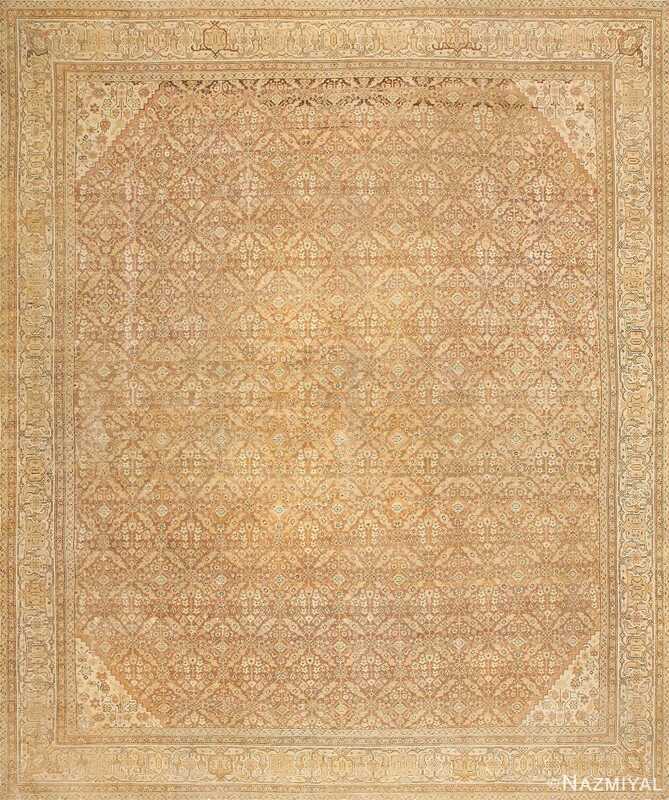 This muted look caught the eyes of London collectors and lead to the popularization of the Amritsar rugs. The popularity of Amritsar rugs is still unceasing. 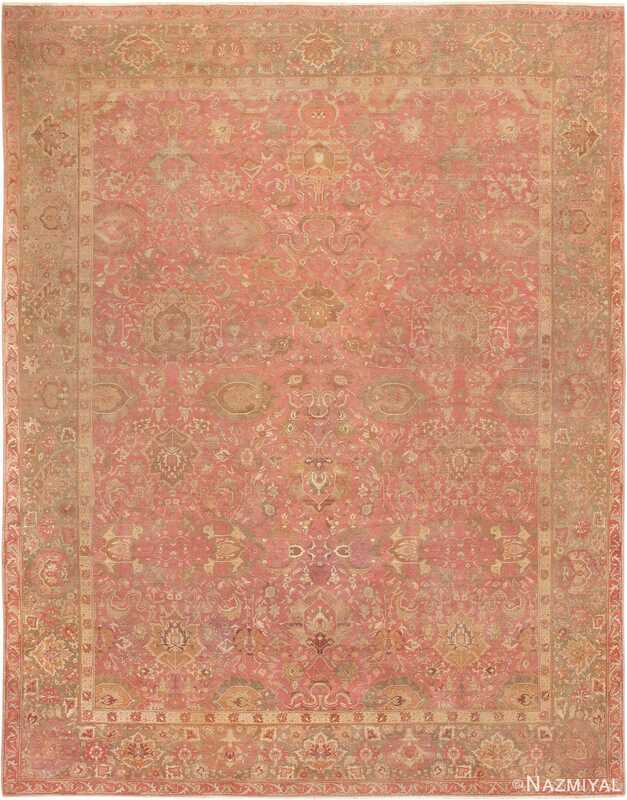 The Western influence on these Indian carpets leaves these rugs under the intense admiration and adoration of art critics and knowledgeable historians to this day. Their reputation lends to their collectability and desirability. Amritsar rugs don’t seem to be exiting the world stage any time soon. 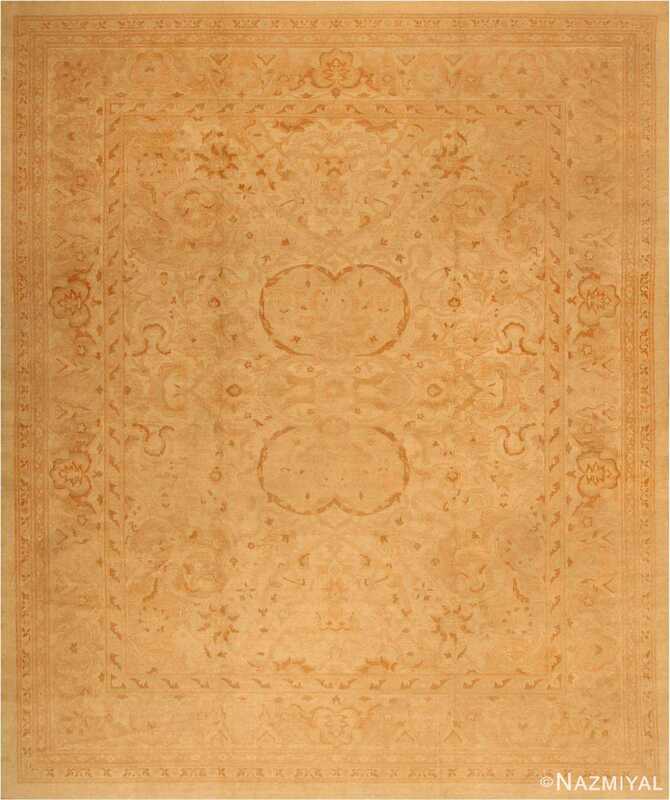 This elegant antique Oriental Amritsar rug from India has a classic Persian pattern of interlacing vinescrolls and palmettes. 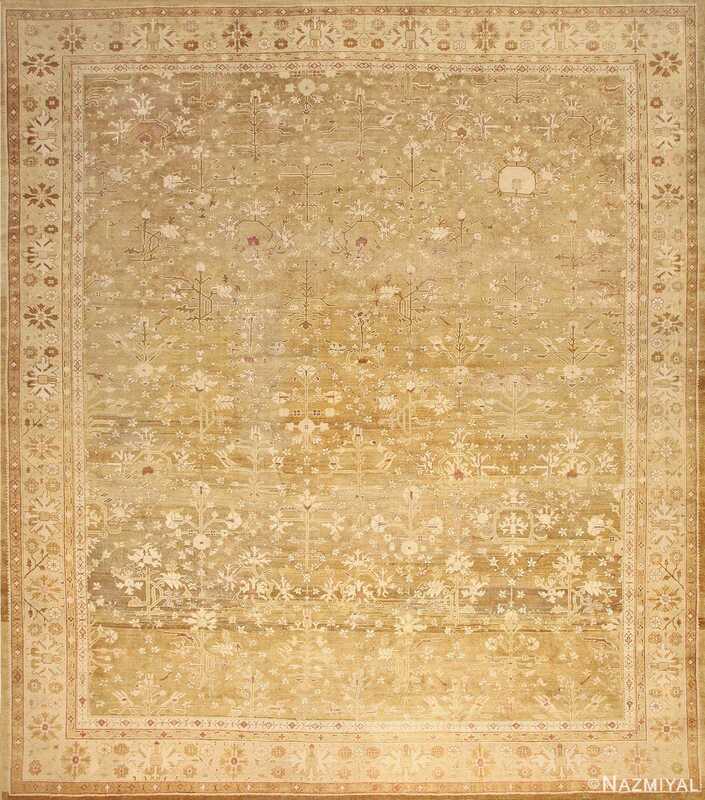 This decorative large scale antique Oriental Amritsar carpet from India has magnificent medallions filled by cloudband palmettes repeating gracefully across the field. 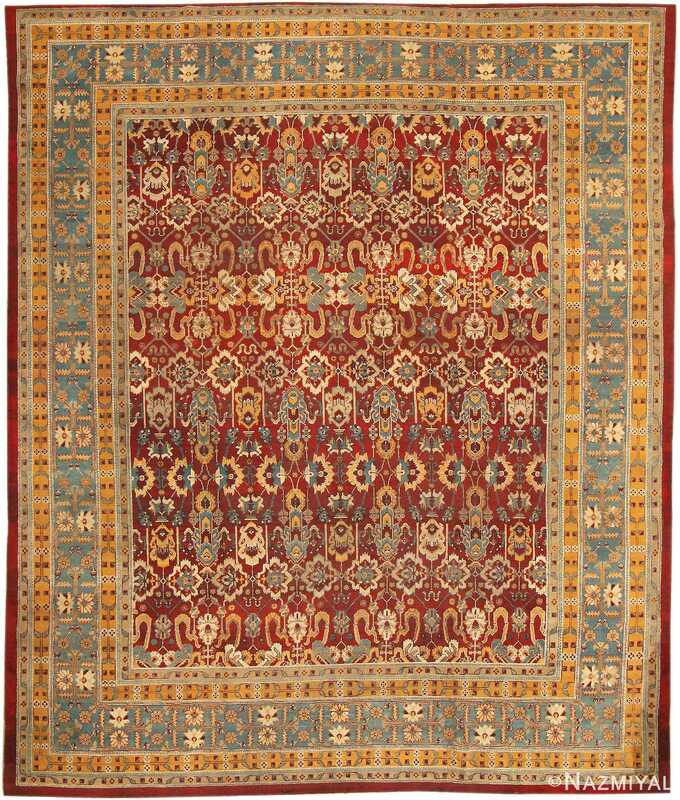 Crafted in the late 19th century, this antique Indian rug has a formal composition and powerful sense of elegance provided by the bold colors and regal decorations. 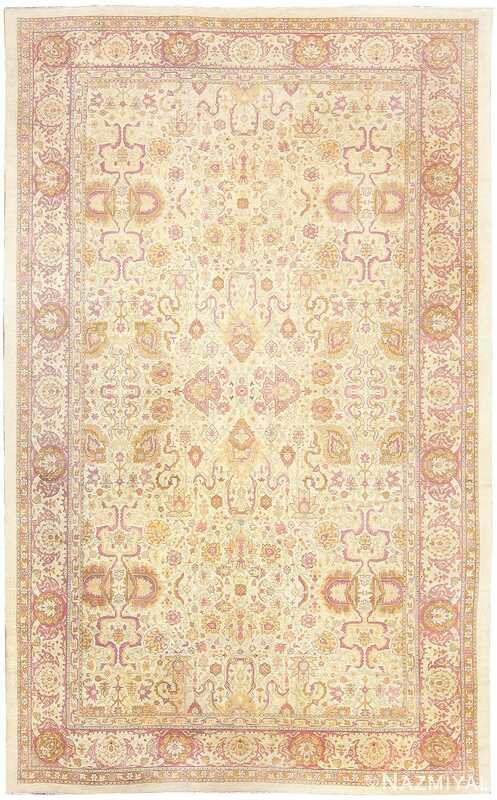 A design of outstanding delicacy drawn from classical Isfahan carpets graces this lovely antique Amritsar carpet from India. 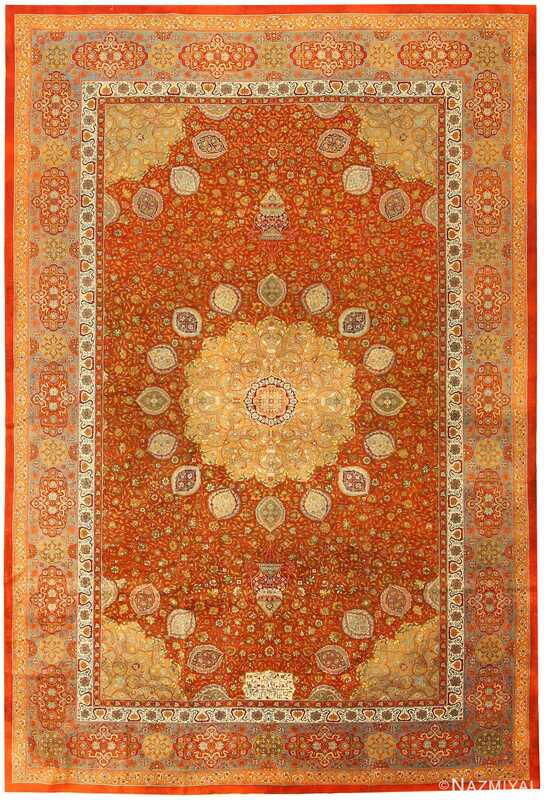 This magnificent antique Amritsaris modeled closely on the famous Ardebil carpet of the early sixteenth century from North Persia. 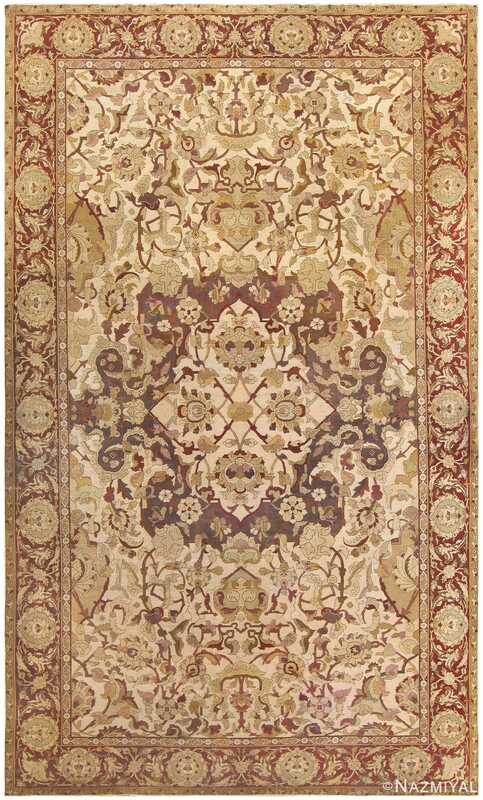 A striking allover design of palmettes, vines, and cloudbands dances rhythmically across the deep burgundy field of this grand Amritsar.